Epsilon Publishers is proud of our commitment in embodying the spirit of the United Nations Global Compact whose fundamental pillars are to their strategies and operations with universal principles on human rights, labour, environment and anti-corruption. 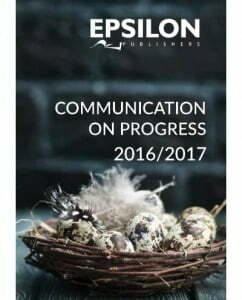 Epsilon Publishers formally signed up to the United Nations Global Compact (UNGC) in January 2016, as part of our broader objective to drive the Pan-African agenda through publishing. We believe that the values espoused by the UNGC are in tandem with our company’s values. This is our communication on progress on implementing the principles of the United Nations Global Compact in supporting the broader UN goals.